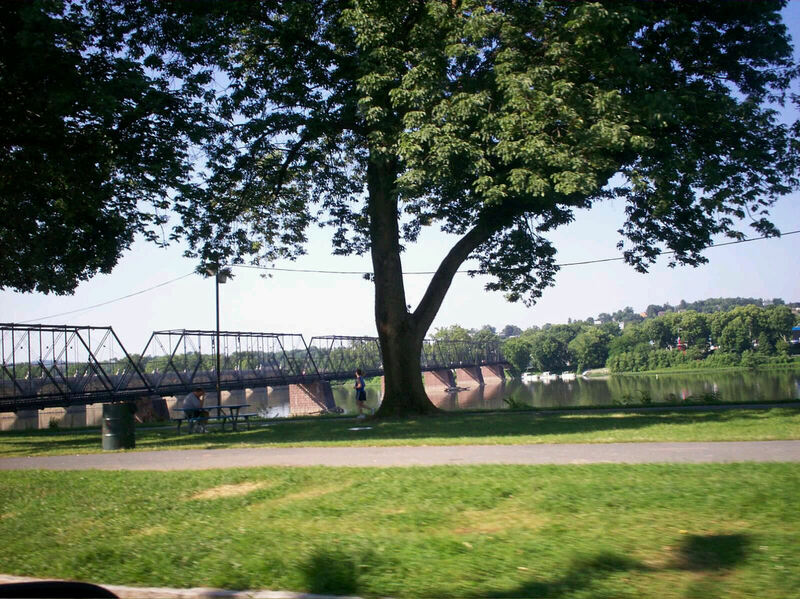 Our 2011 Road Trip, Part 2: The Harrisburg Highlight « Midlife Crisis Crossover! DAY TWO — Sunday, July 10, 2011. 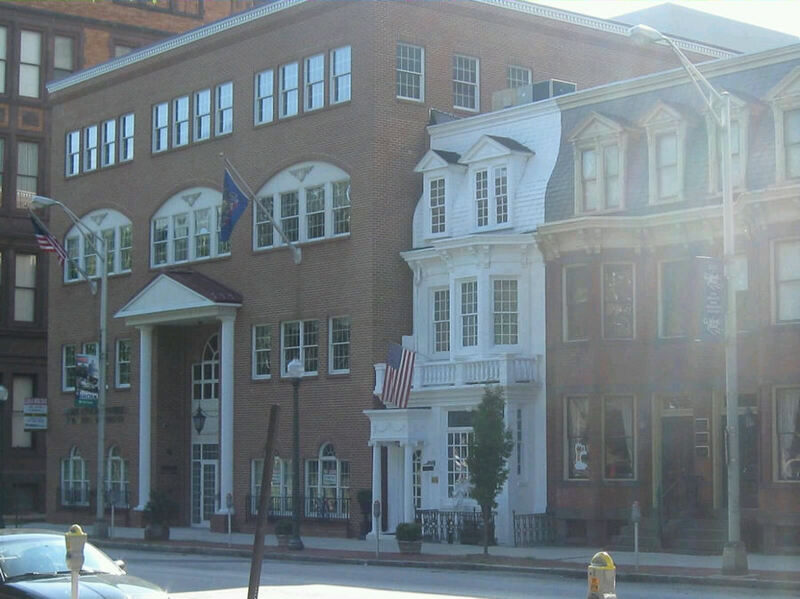 This year, our New Cumberland hotel was right there in the thick of Harrisburg’s interstate construction. Anne was interested but would’ve been willing to bypass it a second time if it hadn’t been so darn convenient. We were right there. A few minutes wouldn’t hurt. Our Harrisburg diversion gave us a chance to see the Susquehanna River, so that was kind of nice. I’m not sure if it has significance outside of “because it’s there” but Anne thought well enough of it to capture its image while I drove. Boats! Hotels! Trees! Probably clean water! We have no idea! This jogger is one of the few citizens awake this early and ready for exertion. My directions weren’t great, so a turnaround or two was required. Fortunately downtown Harrisburg on a Sunday morning was as unpopulated as the second fifteen minutes of a zombie movie, just the right conditions for driving and half-sleeping at the same time. 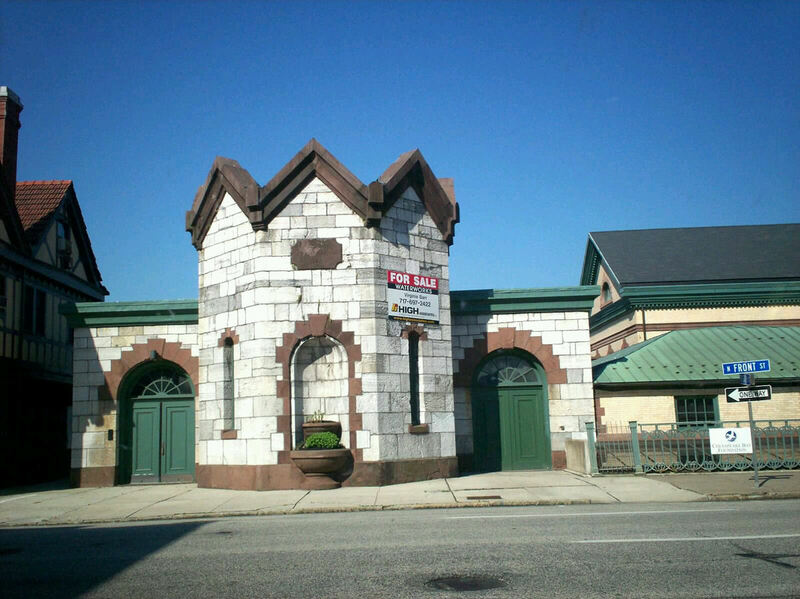 I bet this tiny castle was once an awesome business that deserves a second chance. Curse you, stupid 2008 recession and your disrespect toward fake antiquity. We had time for a little wandering before our lunch appointment, so what the heck. We found their Capitol dome in all its green glory. That’s different. In trying to learn why it’s green, all the internet would tell me is, “Well, actually, that’s a green glaze over red terra cotta tiles.” You’re dodging my question, Internet. WHY GREEN? WHYYYY? The lead photo was taken from the side facing the greater part of their downtown. 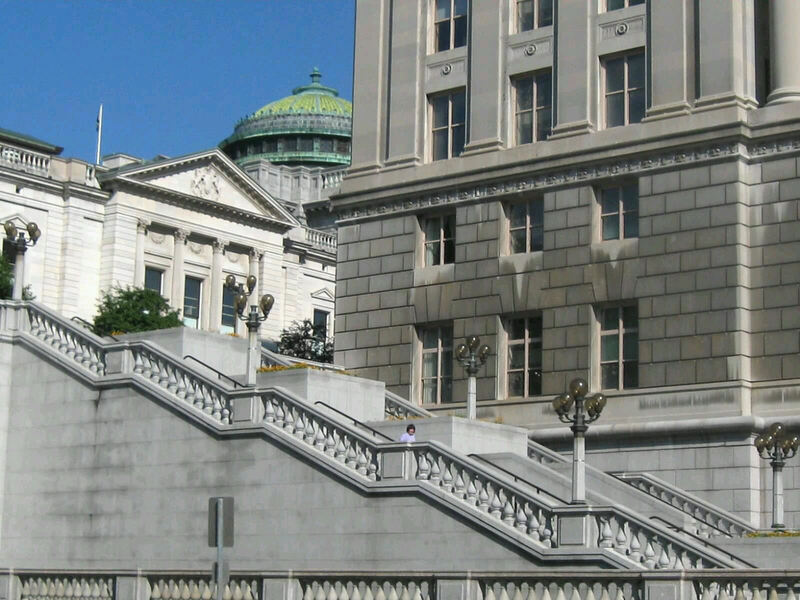 The front of the State Capitol either faces toward the Susquehanna River or points away from it. I never found out because I wasn’t in the mood for driving any more laps around. We parallel-parked at 4th and Walnut and left my son snoozing in the back seat. Across the street were numerous businesses with authentic olde-tyme facades and designs, none of them open. 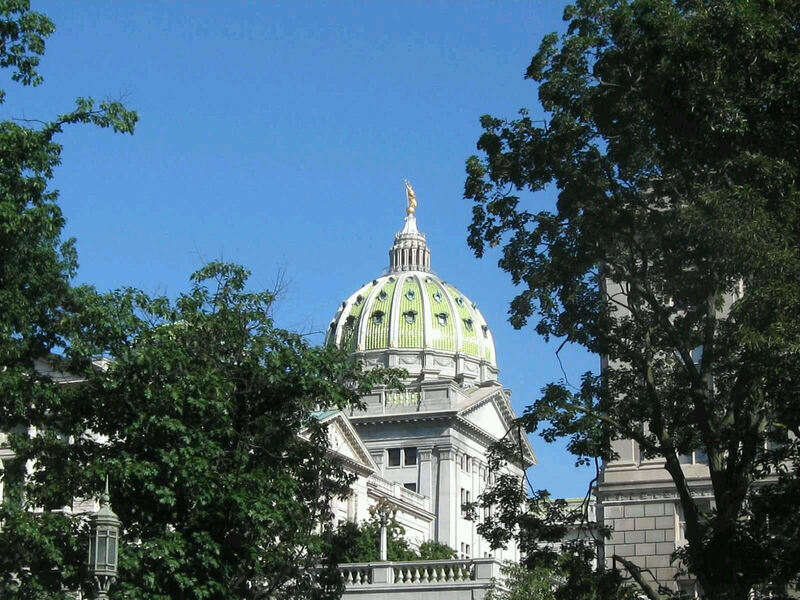 Maybe someday we’ll return for an in-depth examination of Harrisburg. This morning, it wasn’t meant to be. I walked partway up the complex and paused while Anne ran up close like Martin Prince at a box factory. It’s not as though she had to compete with any teeming Pennsylvanian masses. Tiny wife meets giant dome. 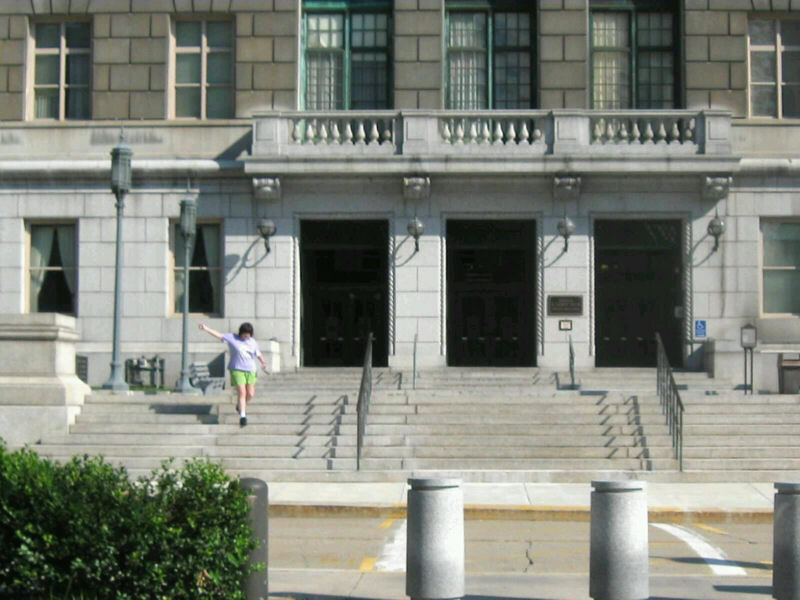 I stayed at ground level and stared at the surroundings for several long minutes until she was finally content with her dome experience and descended the deserted steps before any Harrisburg police could wake up and come boot her off the property. 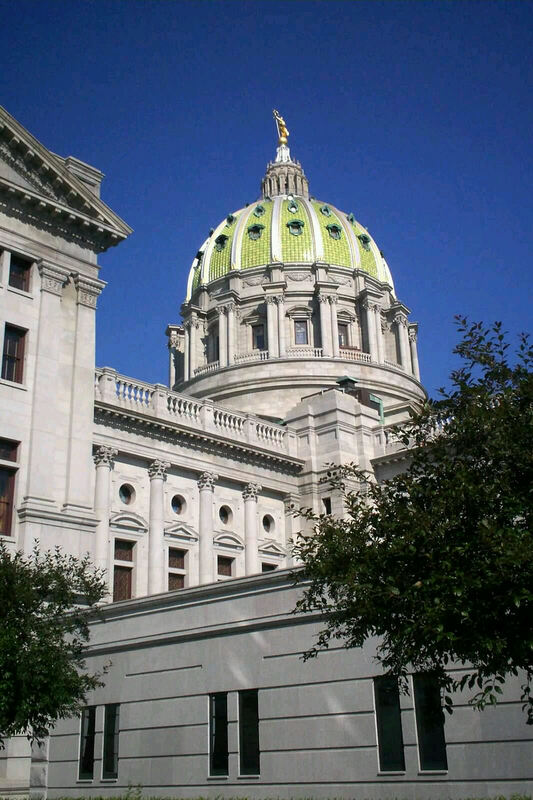 Now we can say we’ve been to Harrisburg. Side quest completed. On to New York City, the place we really wanted to see. 1. We drove through Richmond, VA, on our way to Virginia Beach for our 2008 road trip. In hindsight, finding a single reason to stop in Richmond would’ve improved that complicated vacation by 500% easily. 2. Longtime MCC readers should know State Capitol domes now totally preoccupy us as long as we can see them without making a 100-mile detour for the privilege.